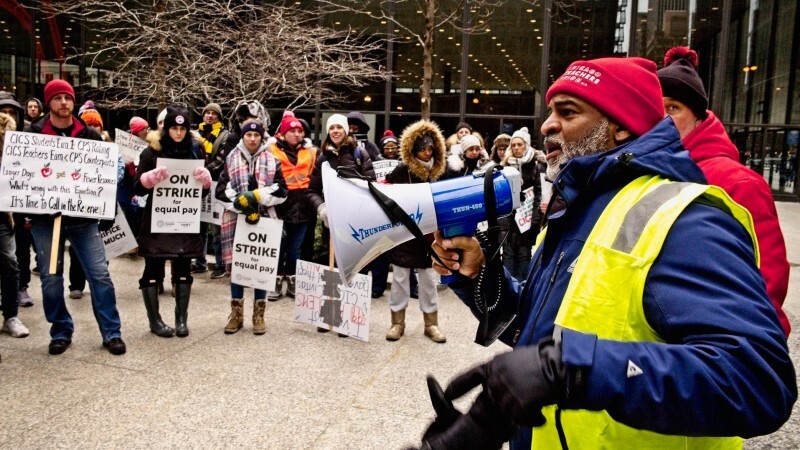 Charter school strike in Chicago ends with workers’ victory | Fight Back! Chicago, IL - Solidarity matters. Teachers and paraprofessionals at the Chicago International Charter Schools hit the picket lines at 6:00 a.m. on February 5 and stayed out until they had won what they needed at 3:15 a.m. on February 17. What they need was smaller class sizes for their students, adequate staffing for special education students, maternity leave for educators and a wage scale close enough to the Chicago Public School teachers to bring some measure of stability to the classroom. Union members will be voting on the proposals which include pay raises of around 35% over the life of the four year agreement. Paraprofessionals fought for and won union recognition for the first time. Not willing to scab on their coworkers, they went out on strike with the teachers. Parents and students overwhelmingly honored the picket line.